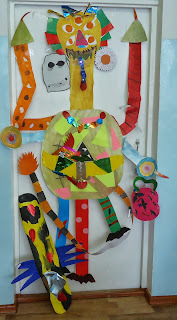 Learning fun in the classroom: Our Monster is ready!! I love your monster! How did you come up with such a fabulous idea? Thank you for visiting our blog! We are taking part in KIDLINK projects - there are a lot of very interesting projects there, Global Monster project is one of them. It was really great!! There are 53 monsters from different classes and countries. Our monster's name is MR Nightmare. WE wrote a poem about him. That is so cool! How do you make them?